I think I managed to leave our half baths floor out of most pics when we moved it to the storage room under the stairs a few years ago. This is because at that point we decided to leave the floors as is and live with them. 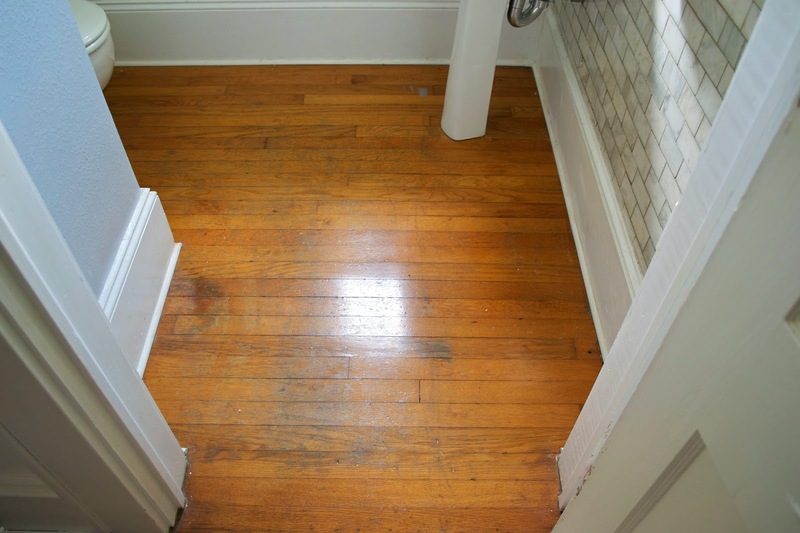 Since this was originally a storage room, these floors in particular were not treated very well and as a result were pretty beat up. PolyShades has stain mixed in with the poly and can go over existing poly. 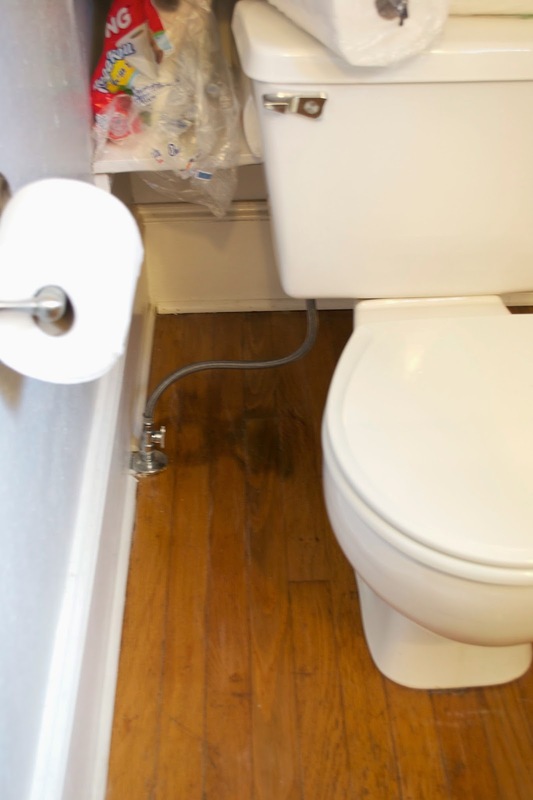 While this isn't necessarily meant for floors, at under $15 for a small can (which I used less than a quarter of) I was willing to give it a shot to see if it would solve our problems and hold up over time. If it doesn't we're only out a few dollars and we're back to the idea of tile so this was the perfect room to try it out. 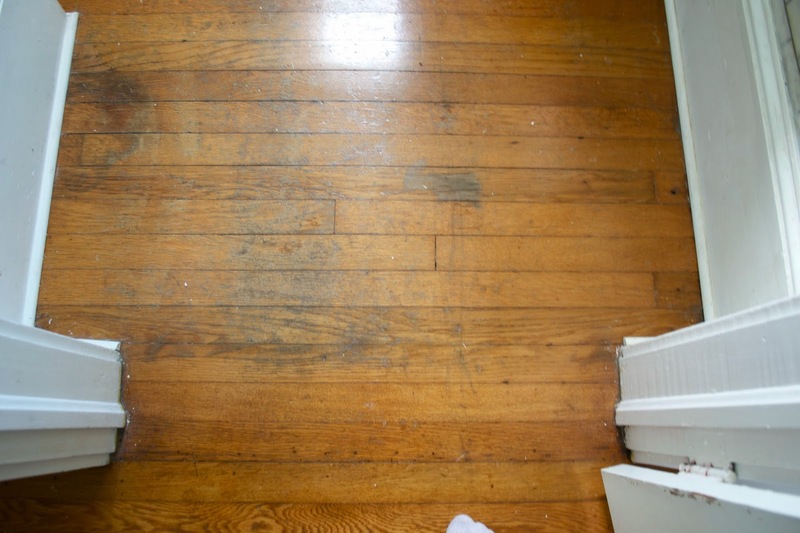 I got a stain that was a little darker than our current floor to help hide stains and to get rid of the orangy color. 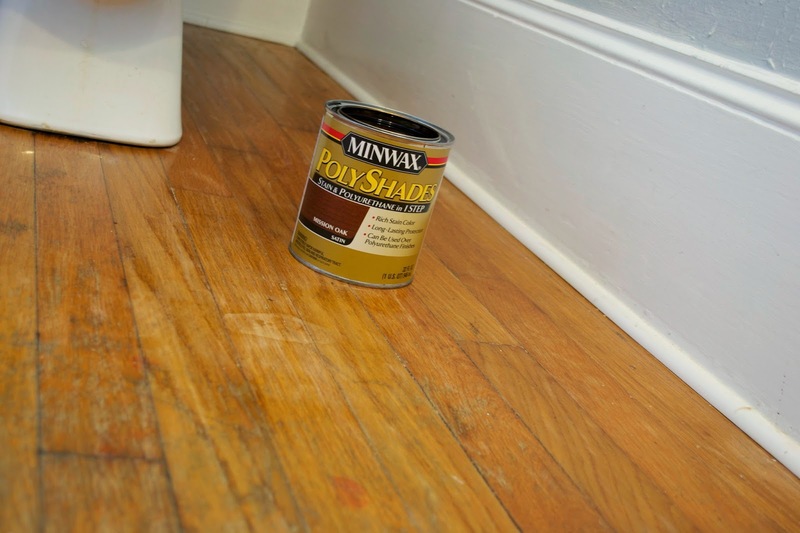 I have read a lot about issues with pain strokes showing and uneven color as well as drying issue and adhesion issues with other people using this on floors. To give this the best chance of working, I spent a lot of time on prep. 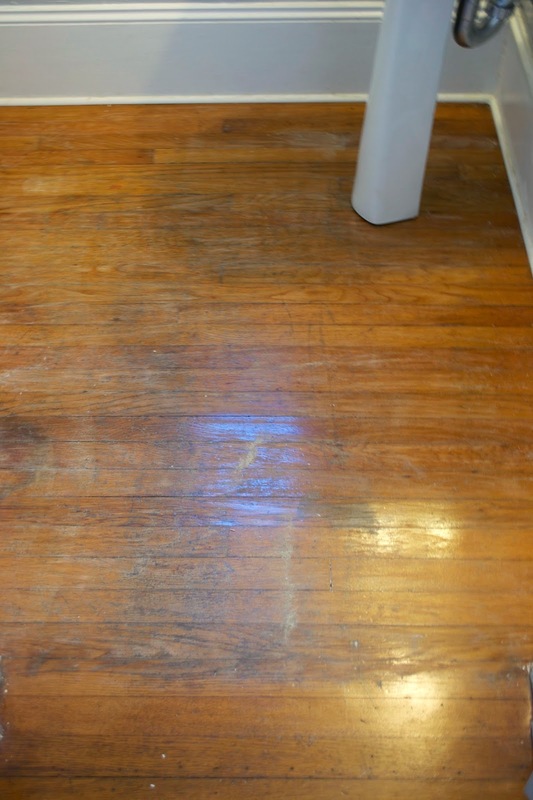 I used a fine grit of sand paper to rough up the floor and spent quite some time getting up all the pain spots so that it was a clean surface. Even with the time spent, I missed two tape residue spots on the floor but I was able to fix it later. After sanding, I cleaned the floor really well and let it dry completely. Then I was ready to apply the stain. For the people out there that were having drying issues, I know the problem. You have to mix the stain really well before application and stir periodically during the process. We've learned the hard way in the past so I did not make the same mistake again. I used a brush made for stain to apply the PolyShades although in the future I might used a foam brush or roller or even a rag since you do really have to pay attention to brush strokes. This was the result immediately after one coat. It was a little humid when I put this down so we let it dry for about 24 hrs and the finish was more matte and hard. Even after the first coat we were loving it sooo much. The floor looked almost brand new and all the stains disappeared. An added bonus is that I love the new stain color so much more than the current floor color. 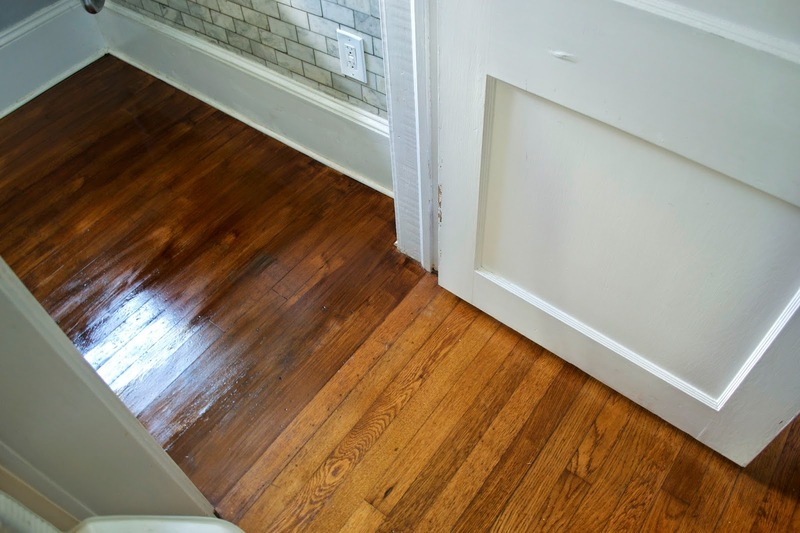 If this ends up working, you may see a lot more floor finishes in the future in this house. We did run into an issue (the missed tape residue spots) so I'll leave you with is pretty picture and come back later this week with our fix, the technique that I found that worked the best, and the final few steps. Oh! I hope this works for you. I'm watching...and waiting for some further reports on this. If it works like you would want...I'm SOOOO GETTING SOME for my living room! Please tell us what color of polyshades you used?? And was is satin, semigloss, or gloss?